This is an abstract of the current issue. To see the full version, click HERE. You must be a member of SPIN to see the full version. Our final issue of the year gives us so many reasons for celebration as 2018 draws to a close! Early in the preparation of this issue, I'd pondered the challenge of crafting a narrative about the range of artistic exuberance, camaraderie and learning at the October SPIN Festival. After all, my perspective represents the point of view of just one participant-observer! However, before too long, the "right" way to approach this challenge became clear. It revealed the opportunity-like no other-to invite some SPIN members at the Festival to share their perspectives on a selection of the striking garments in the Fashion Show. So, I reached out to some of you, and thanks to your responses and back stories about your art, we have a luscious second feature article representing your voices. 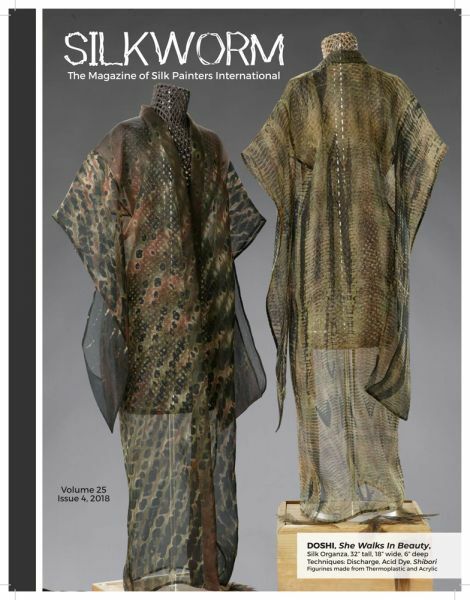 Silkworm readers will gain not only a sense of the visual beauty of the garments, but will also learn a good deal about process, materials and sources of inspiration.